It’s that time of year again – the time where we pick our resolution for the New Year with hopes that we can actually keep them this time. The reason that most New Year’s Resolutions fail is that they are too extreme or time consuming. 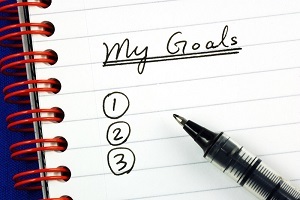 Do you set the same resolutions each year and get the same results? Are you prone to procrastinating with that little voice in your head telling you “it’s ok, you have all year to start trying your goal”? Do you come up with an abundance of reasons why you haven’t started along the path to achieving your goal? Don’t worry, you’re not alone. Who is really going to give up all sweets or stick to sweating in the gym for hours each day? What you need this year is a New Year’s Resolution that is simple enough to become part of your daily life, and will lead to long term success. Make sure you plan in the right place. Take yourself to a favourite spot where you can be alone with your own thoughts. No matter where it is, you’ll find planning your goals so much easier there. Take this process seriously. YOU are the only one that can reach your dreams and goals so make sure you are true to yourself and this process for you, not anyone else. Make sure you distinguish between goals and aspirations. A goal is something that you achieve yourself without outside influence. Aim high, don’t set yourself a goal that you can reach in 2 minutes, make sure it’s something that gives you that intense feeling of achievement when you’ve done it. Write your resolution down. When it’s written it becomes something real and something you can take ownership to, a promise that you are making to yourself. This helps with you wanting to stick to it. Make sure you have it visible – read it daily on the fridge, calendar or email inbox. When you’re reminded every day, it’s hard to ignore it. Drink a large glass of water before each meal. This simple action will help with weight loss and save you mountains of calories in the coming year. By filling your stomach with water right before you eat you reduce your chances of overeating during the meal. Drinking more water is also healthy for all of your body functions, including converting body fat into usable energy. Add a Walk or Jog to your morning. When you get up and move first thing in the morning, before breakfast, your body is more likely to use stored fat as energy. Follow the No Food Three Hours Before Bed Rule. It has been proven that not eating three hours before bed reduces fat storage throughout the night. If you go to bed at 10 p.m., finish eating for the day no later than 7 p.m. Vow to say kind things to someone every day. Not only will you make someone feel good about themselves or what they do, but you’ll feel good about yourself for making someone smile. Something so simple has such wonderful side effects. Remember there are 365 days in the year. Slipping up on your resolution one day here and there might happen or maybe your life takes another direction, don’t let those deter you from sticking with your resolution. Get back to it, or modify it to suit your new situation. A slip or a change can still lead you to success. Now, all you have to do is find the resolution that is right for you and make it a part of your daily life starting 2014!